More of what's to come from the hybrid style. The Nike Flyknit Air Force 1 is looking like Nike Sportswear's worst kept secret in a while, as leaked pairs keep on showing up. This latest image of what's to come for the shoe reveals that the Flyknit x Force look won't be confined to the High silhouette. On the left and on the right in the photo above are Low pairs, each of them shedding the strap and offering up an even lighter version of what's already poised to be one of the most lightweight Air Force 1 builds out there. 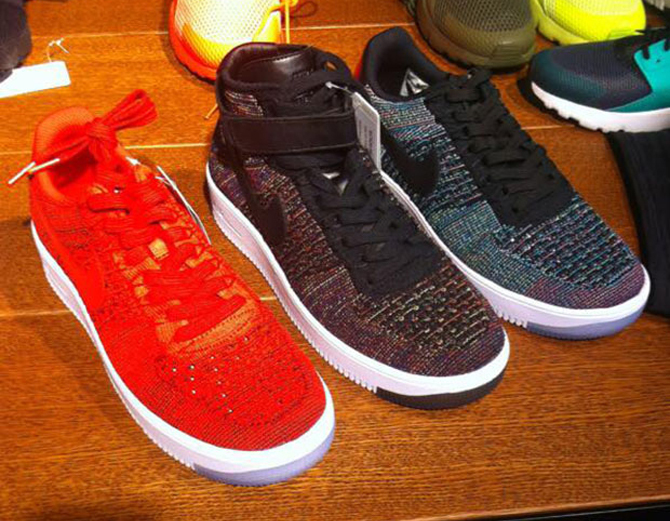 Stay with Sole Collector for sneaker release date info on the pending Nike Flyknit Air Force 1 Low.